A new Kartemquin Films documentary chronicles the life of a Chicago-area artist. In the early scenes of Almost There, the latest Kartemquin Films documentary, the filmmakers visit their subject’s dilapidated home in East Chicago, Indiana. Trash clutters the yard, and from within the overgrown, sunburnt weeds, the jeweled eyes of a feral cat peer into the camera. The image—a beautiful beast hidden within neglect—serves as a visual metaphor for the film. 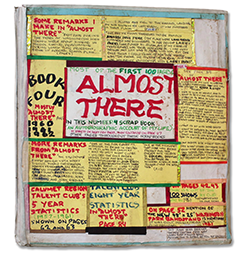 Almost There examines the life of 83-year-old outsider artist Peter Anton. He resides in the basement of his childhood home among decades’-worth of paintings, collages, scrapbooks, and newspaper clippings. The crumbling house threatens to consume both Anton and his work, the ceiling bent and leaking, the mold so thick that visitors wear surgical masks. He rarely leaves his house and relies upon acquaintances for his well-being yet often nitpicks their help. As compelling as the study of this recluse is, the film’s most salient feature is not Anton’s diamond-in-the-rough art, which is most interesting for its sheer quantity and obsessive chronicling. Instead what rises to the surface is the codependent relationship between Anton and the filmmakers—a relationship they’re all aware of and insist upon. Anton reminds the filmmakers that there would be no film without him, while they believe that a project’s greatest collaborator is its subject. After a sold-out viewing at the Gene Siskel Film Center last month, codirectors Dan Rybicky and Aaron Wickenden called their film a collaboration, with Anton narrating parts and creating the intertitle art. He also approved what shots made the final cut, including the filmmakers’ discovery of a troubling story from his past, which threatened to derail his long-awaited Chicago gallery show and the film as a whole. This information doesn’t obscure the rest of the film, however. Almost There reveals how an individual can connect with others and follow his artistic obsessions despite adversity, even (or especially) if that adversity is himself.